Wonder Woman star Gal Gadot has officially joined the voice cast of Ralph Breaks the Internet: Wreck-It Ralph 2. Today, we have a first look at her character, fittingly called Shank. And apparently Disney has dropped the Wreck-It Ralph 2 from its title. It's just called Ralph Breaks the Internet now. 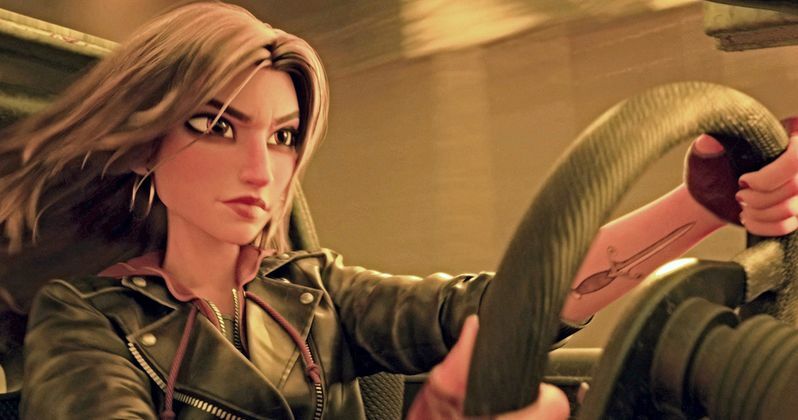 Gal Gadot (Justice League, Wonder Woman) revealed today that she is voicing the character Shank, a tough and talented driver in an intense and gritty online racing game called Slaughter Race, in Walt Disney Animation Studios' Ralph Breaks the Internet, which hits theaters this Thanksgiving. Ralph and Vanellope encounter Shank and her unusual cohorts when they venture to the internet in search of a replacement part for Vanellope's game, Sugar Rush. Shank, a tough-as-nails street racer, takes her role and her tricked-out car very seriously and doesn't like to lose. When Vanellope finds herself in a street race with Shank, her Sugar Rush driving skills are put to the test-and Shank is impressed. Said director Rich Moore. "She is the coolest character in this world of Slaughter Race. Shank's lived a lot, she's seen a lot, yet she's got nothing but kindness in her heart-that's the duality of that character." Said Gadot about her new role with the Disney family. "Shank is amazing at driving cars and has this bad-girl vibe to her. But as the movie goes on you realize how fun, wise and warm she really is on the inside, which is what I like most about her." According to director/writer Phil Johnston, Gadot adds extraordinary dimension to the character. "There's so much texture to her voice and so much living in her voice. If Ralph is Vanellope's big-brother figure, we wanted a big-sister figure. We wanted someone that Vanellope would look up to, and Gal is definitely someone kids, and a lot of adults I know, aspire to emulate. I can't imagine anyone else embodying that part." Shank's approach to racing, and life in general, opens Vanellope's eyes to the limitless possibilities of the internet and the excitement of a new world that feels like home to her. Featuring the voices of John C. Reilly as Ralph, and Sarah Silverman as Vanellope, Ralph Breaks the Internet opens in U.S. theaters on Nov. 21, 2018. This new film re-teams the original director, producer and co-writer behind "Wreck-It Ralph." The screenplay is written by Phil Johnston and Pamela Ribon. Director Rich Moore, producer Clark Spencer, and co-writer Phil Johnston partnered with fellow director Byron Howard and co-writer/co-director Jared Bush to create theAcademy Award-winning blockbuster feature Zootopia. This latest photo from Ralph Breaks the Internet introduces Shank, a tough and talented driver in an intense online racing game called Slaughter Race. Featuring Gal Gadot as the voice of Shank, Ralph Breaks the Internet opens in U.S. theaters on Nov. 21, 2018.